Sarah Kerrigan, who is part of the Target Paediatric AML team in this weekend's Ride to Conquer Cancer from Surrey to Hope. When the 10th annual Ride to Conquer Cancer gets underway this weekend, people who have cycled many miles on Salt Spring will be among the throng. Jana Roerick, and Sarah and Neil Kerrigan are three members of the Target Paediatric AML (acute myeloid leukemia) team, who will be pedalling a 200-kilometre route into the Fraser Valley beginning from Surrey on Aug. 25. (Due to the wildfires, the final route had not been determined as of Aug. 22.) “I am excited about it,” said Sarah Kerrigan, a Fulford Elementary School teacher who has been regularly cycling to and from her Mount Maxwell home and is grateful for the prime training opportunity that climbing island hills provides. “It’s 100 kilometres per day and I feel pretty confident we will be able to do it,” she said about the route last week. Roerick also says she is feeling “very positive” about the ride, although is curious about how the poor air quality will impact riders. She has been training intensely on the island, and also appreciates the hills. Conquer Cancer. 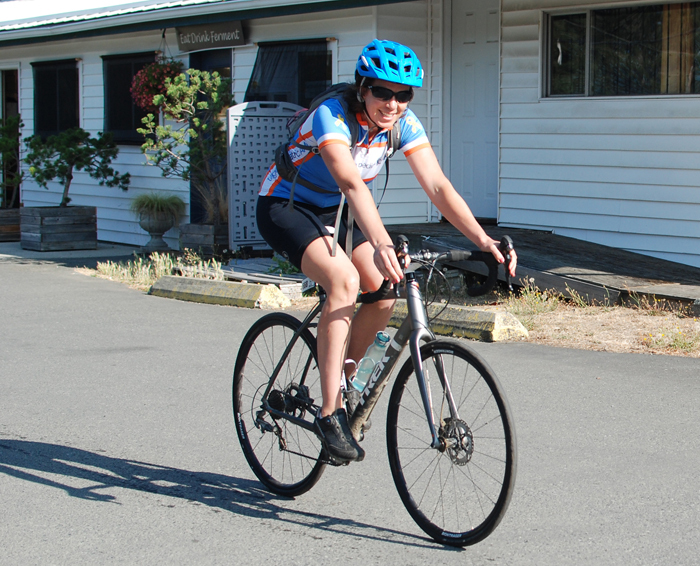 She first rode in 2011 in honour of her friend Deboragh Gainer, the well-known Salt Spring artist who died that year, and then did it again last year. Both times the route was from Vancouver to Seattle. While Roerick had envisioned riding solo this year, when the B.C. Cancer Foundation noted that the Kerrigans were holding a Ride to Conquer Cancer fundraiser at their island home, she was asked if she wanted to join their team. All Target Paediatric AML team funds are aimed at research into acute myeloid leukemia. Sarah Kerrigan’s six-year-old nephew Alexander Stoffelsma, who lives in Saanich, is in remission after first being diagnosed with AML in 2016 when he was four years old. Kerrigan’s nephew thankfully survived and is now thriving — he even attended his first swim meet on Salt Spring this month — but he had to endure four rounds of horrific chemotherapy in the process. Other Target Paediatric AML team members related to Alexander include his mom, dad and grandfather. “The big thing about all of this fundraising is that we want to see more funds go to research to target specific strains of AML because there are several, and if you can target specific strains, then the child may not have to go through such a regimented massive chemo treatment,” explained Kerrigan. Clinical trials for mapping of the AML genome are slated to begin in 2019, she said, so it’s an exciting time to be putting a focus on research into this rare but devastating childhood cancer. Roerick and the Kerrigans have exceeded their individual minimum-required $2,500 fundraising goals but people can still donate to support their cause. Search for them on the conquercancer.ca website. Sarah Kerrigan acknowledged the generosity of islanders, family, friends and local businesses, who all helped the family meet their initial goal.